Request to connect with a baseball injury specialist for an evaluation before going under the knife! With a typical Tommy John Surgery recovery time of 12 to 18 months, many pitching careers are derailed at a young age. Our PRE-SURGERY rehabilitation program can accelerate your recovery and even help you avoid surgery altogether! 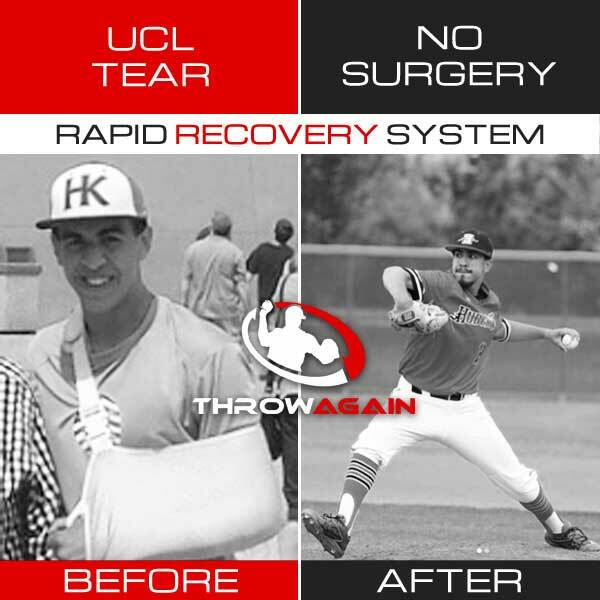 Jordan Rodriguez of Crystal Lake, IL suffered a UCL tear in high school and was considering Tommy John surgery. He opted instead to rehab with ARP Wave Therapy and was able to return to throwing in just a few weeks. Jordan is now pitching at Minot State University! Thank you for saving Jordan's arm from Tommy John surgery. At first I was skeptical but hopeful. But, here he is pitching in college with no arm issues thanks to you. By the way, your Arp Wave therapy saved us tens of thousands $$$ in T.J. surgery & months of rehabilitation! Designed to optimize your recovery before OR after surgery. Copyright © Throw Again - All Rights Reserved.